This is the second part of a series of articles written by Logan Hulsey about his experiences as a Peace Corps Volunteer in Moldova, where he taught English at a local school in the small town of Riscani for 27 months. I’ll always remember one of the first walks I took in Riscani during the first weeks of getting to know the new place that I lived in. There was a lake behind the gold domed basilica at the end of the main avenue of the town. A few days after my arrival, I went to the lake for an afternoon stroll. Looking across it, I couldn’t help but notice the enormous rooftops perched atop the hill. These rooftops were different from the typical Moldovan style; they had curved corners, church like domes, and spires. These buildings looked more like something from India rather than from Moldova. As always, curiosity got the best of me and I immediately decided that I was going to try and see what these buildings were; I just had to figure out how to get to the other side of the lake. After a few hours of wandering, I finally found my way to the hill. I could see the buildings were within easy walking distance. As I continued on, I remember feeling very uneasy. There were packs of stray dogs, the road was noticeably not taken care of, and there were abandoned cars and houses lining the streets. To add to the unnerving atmosphere of the place, there wasn’t a soul in sight. Nevertheless, the unusual architecture drew me ever closer. To my surprise, upon reaching one of the buildings, I found it equally as abandoned and run-down as the house adjacent to it. It was an elaborate mansion, guarded by lion sculptures, supported by massive columns, and surrounded by a regal gate. It had floor to ceiling windows, a multi-car garage, and a double front door that must have weighed 300 pounds. Despite all this, the curtains were drawn, the yard was a jungle, and the gate was chained shut. As I walked down the street I discovered that most of the other houses were not even completed. Some were little more than frames or had only one floor finished. In fact, I only saw two or three that were actually inhabited. This was not uncommon, however, as many construction projects in Moldova lose funding and become abandoned, or they are used as a way to avoid taxes on a completed house. Tracing their roots to the Indian subcontinent, the Roma are one of the most well known itinerant groups, who through their migration westward, ended up in Europe during the 14th and 15th century. Throughout history, their nomadic and secluded nature has given them a reputation of being exotic mystics throughout the literature and folktales of Europe. However, this has also given way to their reputation as criminals and thieves, resulting in their role as scapegoats throughout history. This reputation persists to this day and is the cause of harmful prejudice in just about every country they travel to or live in. Continuing my research, I found that the Roma have had a long history in the area of what is now Romania and Moldova. In Moldova today, there is estimated to be between 15,000 and 20,000 Roma according to the official 2007 census; but Roma leaders claim that there are over 250,000 present in the territory of Moldova, making them roughly 7 percent of the population. 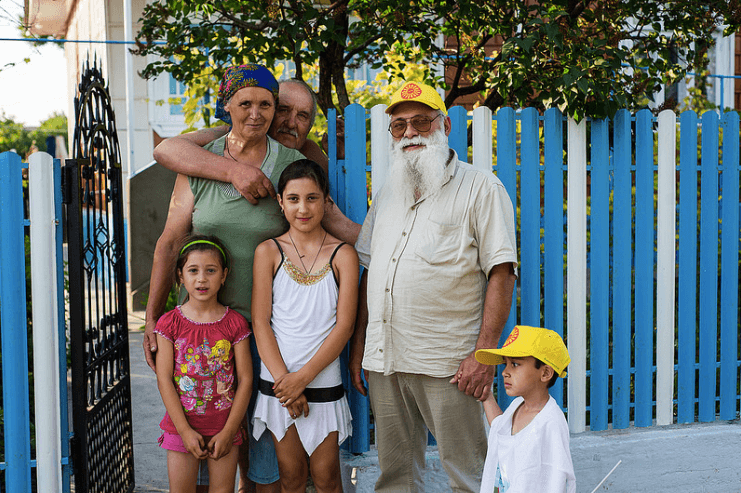 Independent of its size, the Roma community in Moldova is very diverse and there are different reasons as to why it is difficult to measure the population. Already during the Soviet times it was hard to appreciate the number of Roma living in Eastern Europe as many refused to admit their Roma decent for fear of discrimination. While some keep a traditional and secluded lifestyle, many of the Roma in Moldova today consider themselves Moldovan citizens primarily. Most of the Roma living in Moldova, reside in the northern parts of the country, most notably, in the city of Soroca, considered by many to be the unofficial Roma capital of Moldova. While the Roma in Moldova do not have a particular centralized leader, Artur Cerari of Soroca, is widely recognized to hold the title of “King of the Roma”. Cerari, who resides in an enormous mansion on the famous “Gypsy Hill” of Soroca is known to be charismatic. His main role as the symbolic and unofficial leader of the Moldovan Roma, means that he represents them at ceremonial events, and when he’s available he’s always happy to meet with tourists and invite them into his home; this has made him something of a tourist attraction for Soroca. While I have not met him myself, I know several who have, and have even been guests in his home. During the Soviet Union, the nomadic nature of the Roma was discouraged, and there were forced settlement programs enforced by the government. As a result of this, many of the Roma in Moldova are sedentary. However, they still maintained relationships outside of the Soviet Union. As with many people in the Soviet Union, heavy bureaucracy and corruption forced them into the second economy, that is, the informal economy that existed side by side with the command system that the Soviet leaders had established. Through their connections with people outside of the closed communist system, many Roma in Moldova became quite wealthy through smuggling and expanding black markets, however, many others live in poverty. In Riscani, I noticed that the Roma population of the city (between 7 and 15 percent) seemed to be concentrated in two particular areas, both on the peripheries of the town. One was the neighbourhood that I visited upon the hill overlooking the lake, and the other was in a valley that few people lived in, due to the fact that it was a floodplain. Both of these neighborhoods were easily discernible because of the large peculiar looking mansions. From what I could see, the Roma did stand out in the fact that they mostly seemed to stay in gender segregated groups in public settings. I would see groups of women go shopping together while men would sit in the park together. I also noticed that many women would wear long hair and skirts not seldomly covered with sparkly patterns and jewelry. While the Roma in Riscani mostly spoke Russian, they also spoke a regional version of the Romani language. While I never really got to know any Roma families, they tended to be quite large. After my time of living there, I was eventually able to recognize who the local Roma were and who the visitors were. There were constantly new groups of Roma that would pass through for a brief time, and I would never see them again. They were a very secretive group and did not participate very much in the community. Many Roma would attend public events such as festivals or holiday celebrations, but nothing more. On the contrary, they held many private events, but they would be very public and extravagant. I remember walking home from work and seeing a funeral parade that was blocking the main road of the town. The parade must have been around 100 people, all dressed in formal clothes. They carried the open coffin through the streets, led by icon bearers, and trailed by musicians. Finally, as with the rest of the town, the Roma in Riscani were quite devout Orthodox Christians, they participated in religious events along with the other residents of the town. They would be present at sunrise on Easter to receive the priests’ blessing and could often be found near the church. Of course at this point I must point out the subject of prejudice against the Roma community. The perception of the Roma in Moldova were similar to how they are seen all throughout Europe; that they were all criminals and thieves. While the topic of Roma is sensitive and sometimes controversial, this type of negative and harmful stereotyping is partly rooted in a long tradition of excluding Roma from participating in the societies that they have lived in. As a result of this, many Roma groups throughout Europe live under poor socio-economic conditions and faces severe marginalization in society. In Moldova, part of the problem is a lack of understanding between Moldovans and the Roma group. I believe that a Roma would have trouble integrating into Moldovan society if they tried due to some of the prejudice that exists. I will of course, not claim that Moldovans are racist, but some of the things I observed are worth noting in order to point out the divide between what seems to be two parallel societies living in the same place. I was once warned not to look into the eyes of a Roma because they would hypnotize me. When Moldovan children acted up in class, they would be told that they are acting like “gypsies”; once while Roma students were present in the class. One of my colleagues was asked to sit watch at a center for disabled children in order to “protect it from the gypsies”. Finally, I remember a discussion during a feast, where one individual was asking about the Roma. “Where do they come from?” he asked, to which an educated young woman answered “They came from India a very long time ago.” The individual then asked “Why don’t they go back there? …we’re always told to respect them, but why don’t they respect us?”. This is the exact rhetoric that fuels prejudice against the Roma. I have heard the same said about the African American community in the United States. The fact is that the Roma are as much a part of Moldovan society as the Ukrainians, Russians, and Gagauz. They have lived through all part of its history and call the land “home”. While the Roma may seem like a marginalized group, sometimes locked in old traditions, and keeping to themselves; it is important to remember that they are a part of society. They are, most certainly, affected by things such as politics, economics, and globalization. It is easy to imagine them as living in their own parallel world, but the truth is that they’re not, they’re humans, living in our world. Logan Hulsey is an American student taking part in the CEERES program at the University of Glasgow, Scotland. His dissertation research will be focused on religious and linguistic minority groups in the Republic of Georgia. Additionally, Logan spent 2.5 years in Moldova with the Peace Corps, where he devoted an extensive amount of time studying Russian and traveling around the Eastern European region.